Human connection affects much more than the bottom line. Organizations thrive when employees feel valued, the environment is energized, and high productivity and innovation are the norm. This requires a new kind of leader who fosters a culture of connection within the organization. Michael Lee Stallard's Connection Culture provides a fresh way of thinking about leadership and offers recommendations for how to tap into the power of human connection. If you want to begin fostering a connection culture in your organization, this book is your game-changing opportunity. Stop undermining performance and take the first step toward change that will give your organization, your team, and all whom you lead a true competitive advantage. Inspiring and practical, this book challenges you to set the performance bar high and to keep reaching. 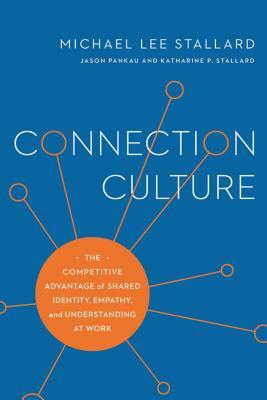 In this book you will learn how to: - foster a connection culture - emulate best practices of connected workplaces like those at Pixar and Duke University's men's basketball team - boost vision, value, and voice within your organization. Michael Lee Stallard is president of E Pluribus Partners, and a speaker, teacher, and consultant on leadership, employee engagement, productivity, and innovation. He is the primary author of Fired Up or Burned Out: How to Reignite Your Team's Passion, Creativity and Productivity and a contributor toThe ASTD Management Development Handbook. Articles written by Michael or about his work have appeared in leadership periodicals worldwide. He has spoken or taught at many leading organizations, including General Electric, Google, Johnson & Johnson, the M.D. Anderson Cancer Center, the NASA Johnson Space Center, Scotiabank, the U.S. Treasury Department, and the Yale-New Haven Hospital.